The Ford typewriter was invented by Eugene A. Ford and was manufactured by the Ford Typewriter Company of New York in 1895. There was no connection to the Ford Motor Company that was founded in 1903. 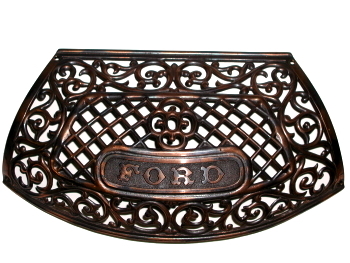 The Ford's most distinguishing characteristic is an ornate latticework shield, finished in bronze, that served as a cover for it's type mechanism. 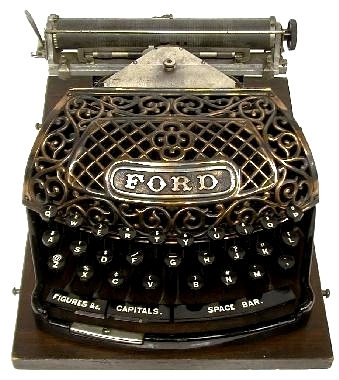 Incorporating thrust action type and controlled by a three row, curved keyboard, the Ford also had the distinction of being one of the earliest typewriters manufactured in lightweight aluminum. Also in the offering, was a cast iron version, painted black. The cast iron Ford was advertised for sale at $75. while the lighter weight aluminum Ford was $85. The Ford typewriter was also sold in Germany as the Knoch and in France as the Hurtu. 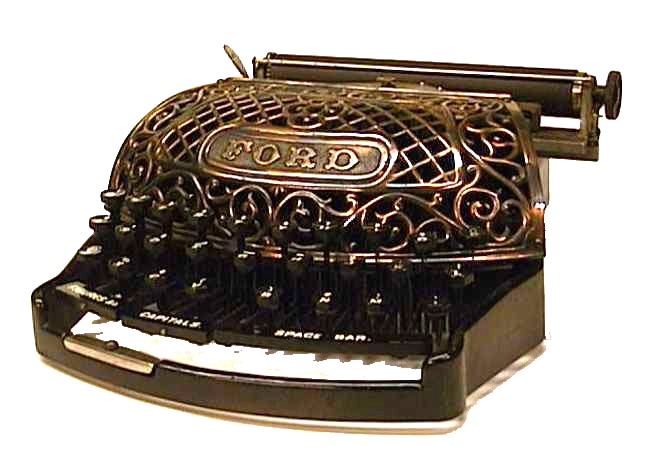 Despite many advanced features and the promise it offered, the Ford typewriter was a marketplace failure and quickly disappeared from the 1890's typewriter scene. Few were manufactured and even fewer have survived. As for Eugene Ford, he went on to a distinguished career as an engineer for IBM Corp.
Pictured above is Ford serial number 763 from my personal collection. Below are Ford Grill, Ford on Original Wood Base and Advertisement, circa 1895. Read about a marvelous Ford typewriter find.